Anita Kelava (31) of the University of Maine tries to trap Binghamton's Alyssa James during their America East quarterfinal in Portland last Saturday. Kelava is among the freshmen who have helped the Black Bears reach the conference championship game. 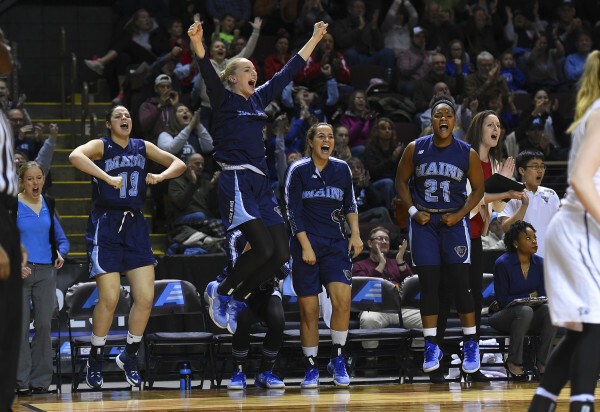 The University of Maine women’s basketball team is the youngest in the America East tournament this season. The Black Bears certainly are among the least experienced squads in the country. 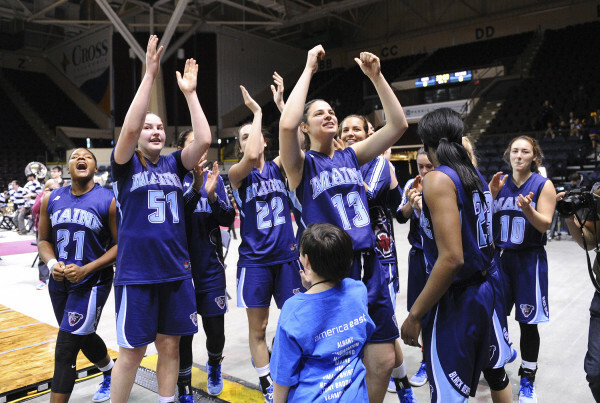 The fourth-seeded Black Bears started three freshmen (guard Blanca Millan and forwards Anita Kelava and Fanny Wadling), a sophomore (guard Tanesha Sutton) and senior guard Sigi Koizar in their 57-40 win over No. 5 Binghamton and their 61-52 triumph over top seed the University of New Hampshire. UNH started four juniors and a senior while Binghamton started two juniors, two sophomores and a freshman. Against Binghamton, the two reserves who saw the most minutes were freshmen Julie Brosseau and Laia Sole. They each logged 17 minutes. Sole (13 minutes), Brosseau (10) and another freshman, Naira Caceres (5), got the most minutes off the bench against UNH. But UMaine’s freshmen aren’t your typical freshmen. They play like seasoned veterans. Yes, they make mistakes like any first-year players. But they are fearless and aggressive. They aren’t afraid to make mistakes. That is a common problem for first-year players. In their quest to play mistake free, a lot of freshmen become tentative and that impairs their effectiveness. They also have a little swagger. They don’t go out hoping to win. They expect to win and will do whatever it takes to do so. Associate head coach Amy Vachon, filling in while head coach Richard Barron remains on medical leave, and her coaching staff (Edniesha Curry, Samantha Baranowski and Jhasmin Player) deserve a ton of credit for guiding this youthful team to Friday’s America East championship game against Albany in New York. They have created an environment conducive to learning and player development. They have been able to mold players from six different countries into a cohesive, tight-knit group that has an infectious enthusiasm. The players on the bench are constantly hollering encouragement to their mates. The leadership of Koizar and fellow senior Sheraton Jones has also been important. Vachon’s implementation of a matchup 2-3 zone held New Hampshire to 30.6 percent shooting from the floor including a 3-for-14 showing (21.4 percent) in the decisive fourth quarter during which UMaine outscored the Wildcats 25-15. “If I was coaching against our team, that’s what I would have used,” said UNH coach Maureen Magarity, who credited UMaine with playing exceptional defense. UNH shot 6-for-28 (21 percent) from beyond the 3-point arc. In the quarterfinals, Binghamton shot just 31.1 percent from the floor and Millan held the conference’s second-leading scorer, Imani Watkins, 12 points below her scoring average. 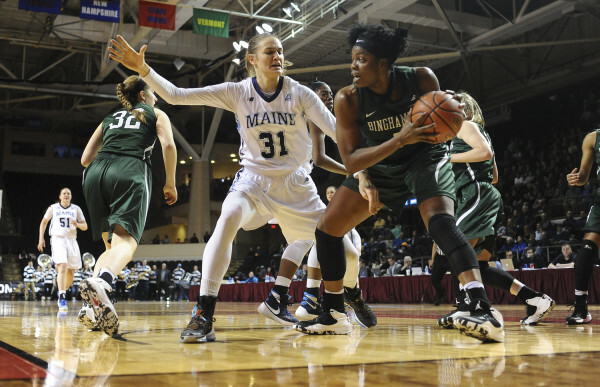 The Black Bears also held standout forward Alyssa James to eight points, three below her average. Millan’s exceptional instincts, long arms and active hands make her a shutdown defender on the perimeter. She leads the team in steals with 60. The interior tandem of Kelava and Wadling helped limit America East Player of the Year Carlie Pogue and fellow inside threats Kat Fogarty and Olivia Healy to a combined 24 points and 17 rebounds. They had averaged 38 points and 19 rebounds. Vachon and her staff also made intelligent substitutions. For example, in the Binghamton game, Wadling had four turnovers in 16 minutes so Vachon inserted Sole, who responded with six points, five rebounds and just one turnover in 17 minutes. Kelava played a season-high 35 minutes and had 10 points, eight rebounds, three steals and three blocks against Binghamton. But Sole struggled against UNH with four turnovers in 13 minutes so Wadling wound up playing 33 minutes and produced seven points and seven rebounds. Then there is the tireless and relentless Koizar. She played all but one minute in the two games and led the team in scoring each game with 16 and 21 points, respectively. Her seven free throws in the fourth quarter sealed the win over UNH as did her clutch steal out of a UNH player’s hands. The three-time, first-team All-AE guard constantly had the ball in her hands and turned the ball over just twice in two games. She never turned it over against New Hampshire. She directed traffic and has been a calming influence for her youthful teammates from day one. The Black Bears will have their hands full against Albany but they certainly answered the bell in their first two postseason games.